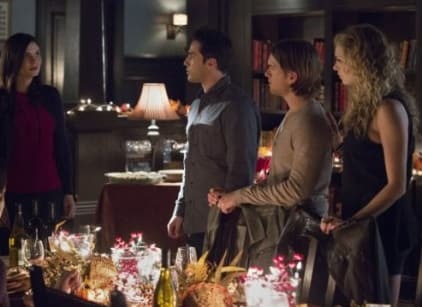 Caroline and Elena host Friendsgiving on The Vampire Diaries Season 6 Episode 8, but unfortunately Stefan isn't invited. It doesn't end up mattering much since Stefan, Damon, and Alaric head to Portland, Oregon to try and make some headway with the Gemini Coven and getting Bonnie back. The one bright light in the whole holiday is that Caroline and Elena find out that Bonnie is still alive, though if Kai has anything to say about it, it won't be for long. At Friends-giving, Jo recognizes Liv but can't put her finger on it. Then when the group is watching Luke's childhood videos of Liv, Jo hears her own voice on the tape and realizes that they are her long lost siblings. Jo saved their lives back in 1994 when Kai went crazy and on a murdering spree. It also turns out that not only is Jo Kai's sister, she is also his twin. In the Gemini Coven, when twins turn 22, they merge. One absorbs the magic and becomes the leader and the other dies. Since Kai wasn't born with magic, the parents kept trying for a new set of twins and had Liv and Luke. When Kai realized why, he lost it and killed most of his family. Back in Oregon, the boys figure this out and have a run in with Jo's dad. They find Jo's magic and stop her dad from killing her. Unfortunately Kai finds her magic in the other realm as well. Using Bonnie's blood, he heads back to Mystic Falls without her. Whoop, be careful. You just sounded generally concerned for my brother. Permalink: Whoop, be careful. You just sounded generally concerned for my brother. Why wouldn’t I consult you in a decision that might permanently change your life? Hmm I wonder. Permalink: Why wouldn’t I consult you in a decision that might permanently change your life? Hmm I wonder. The Vampire Diaries Round Table: Should Staroline Happen?